Yamaha vintage analog tape plug-in collection. The recreation of analog tape characteristics has always been a demanding discipline. 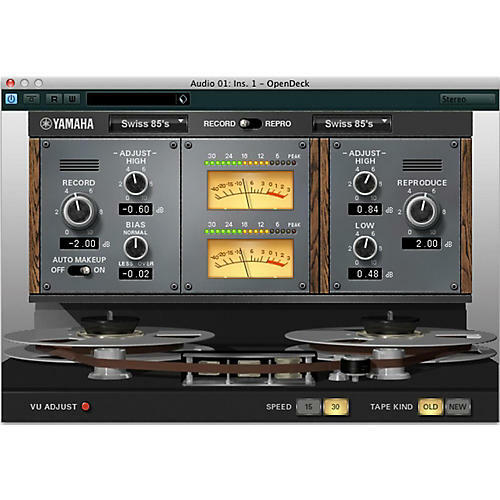 The Vintage Open Deck software download employs the VCM technology to recreate the analog circuitry and tape characteristics that shaped the sound of open-reel tape recorders. Legendary tape recorders from Studer or Ampex have created a sound, which is only difficult to find in today’s production environments. The Vintage Open Deck is a four-in-one tape machine emulation with different sound characteristics to choose from: Swiss ‘70, Swiss ‘78, Swiss ‘85 and American ‘70. For an even wider range of variation, the characteristics can be individually applied to the record and playback decks. Thanks to the Virtual Circuitry Modeling technology (VCM) the Vintage Open Deck not only reproduces the original vintage tape recorder sound, but is also highly configurable. The Vintage Open Deck provides four different machine types: Swiss ’70, Swiss ’78, Swiss ’85 and American ’70. Each machine type can be applied to the record and playback deck — independently. This flexibility enables to combine different machine types, achieving breathtakingly sounding results that are reminiscent of the 1970s and 1980s. But there’s even more to it than that. Beside the combination of different record and playback decks, parameters such as tape speed, bias and EQ settings, distortion and saturation characteristics can be adjusted, allowing the engineer to have full control about each detail of the tape mastering process. In addition, even the type of tape can be selected — a new and an old tape are selectable. Through parameters such as Record, located on the Recording Deck, the input level is adjustable, allowing to exactly determine the level of tape compression. In addition, the BIAS/Rec knob allows you to control the distortion level. By using Auto Makeup gain, the audio level of the reproduction deck reflects changes on the recording deck but maintains the relative output level. To adjust only the high frequencies, the Adjust High knob is the right parameter. Order today and add a touch of analog tape saturation to your digital mixes.